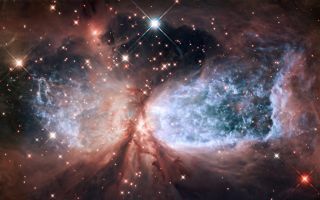 The bipolar star-forming region, called Sharpless 2-106, or S106 for short, looks like a soaring, celestial snow angel in this cool space wallpaper. The outstretched "wings" of the nebula record the contrasting imprint of heat and motion against the backdrop of a colder medium. Twin lobes of super-hot gas, glowing blue in this image, stretch outward from the central star. This hot gas creates the "wings" of our angel. A ring of dust and gas orbiting the star acts like a belt, cinching the expanding nebula into an "hourglass" shape.